HPV vaccine like gardasil can be used to help prevent not only genital warts, but also oral warts and warts of the airway. Such warts are known as papillomas and can keep recurring after surgical excision leading to lifelong morbidity. Although gardasil and other HPV vaccines are typically used to vaccinate young tweens, it has been found effective even in much older individuals. In this study, the HPV vaccine decreased the incidence of surgeries for recurrent respiratory papillomas in 6 patients. In another case study, a child who required repeated surgeries to remove recurrent laryngeal papillomas was "cured" after HPV vaccination. In two other studies, this vaccine minimized papilloma formation in the airway of a child (see references below). Apparently, these are not isolated cases. In the reported literature, 8 others have noted the same improvement with oral papillomas. Time to improvement was seen within 4 weeks of vaccination and resolution after 3 to 8 months. Given these promising findings, quadrivalent HPV vaccination may certainly be worth pursuing in any patients of any gender at any age suffering from oral/airway papillomas. All vaccines are administered through a series of 3 intra-muscular injections over a 6-month period. The second and third doses should be given 2 and 6 months after the first dose. 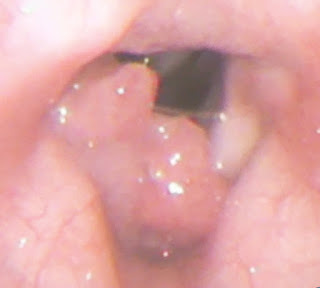 Recurrent laryngeal papillomatosis: successful treatment with human papillomavirus vaccination. Arch Dis Child. 2011 May;96(5):476-7. doi: 10.1136/adc.2010.198184. Epub 2011 Jan 10. Immunological response to quadrivalent HPV vaccine in treatment of recurrent respiratory papillomatosis. Eur Arch Otorhinolaryngol. 2016 Oct;273(10):3231-6. doi: 10.1007/s00405-016-4085-3. Epub 2016 May 17. Gardasil Vaccination for Recurrent Laryngeal Papillomatosis in Adult Men: First Report: Changes in HPV Antibody Titer. J Voice. 2017 Jan;31(1):104-106. doi: 10.1016/j.jvoice.2016.01.008. Epub 2016 Apr 8. Intersurgical interval increased with use of quadrivalent human papillomavirus vaccine (Gardasil) in a pediatric patient with recurrent respiratory papillomatosis: A case report. Int J Pediatr Otorhinolaryngol. 2016 Dec;91:166-169. doi: 10.1016/j.ijporl.2016.10.032. Epub 2016 Oct 28. Therapeutic use of the HPV vaccine in Recurrent Respiratory Papillomatosis: A case report. Int J Pediatr Otorhinolaryngol. 2017 Feb;93:103-106. doi: 10.1016/j.ijporl.2016.12.035. Epub 2016 Dec 27.